Haven’t you always wanted to see a time capsule opened? Especially if it is a mystery time capsule. with no record of who planted it or what is inside? Bidwell Mansion State Historic Park has it’s very own mystery time capsule. It was discovered when this monument had to be moved. 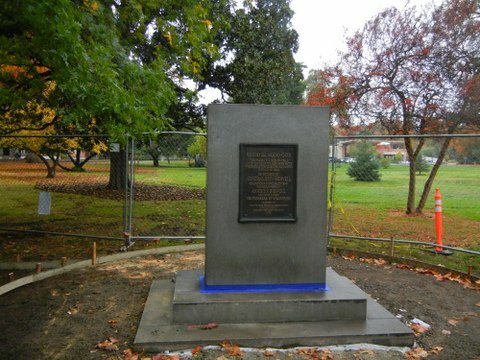 The monument stands at the corner of the Esplanade and So-Wil-Le-No Ave., right next to Chico Creek. The city is improving the street and sidewalk, so they had to move the monument 10 feet back. When they took the upright off the base, they found inside a copper box sealed with lead solder. No inscription, no instructions. The monument was erected in 1925 by the Pioneer Historic Association of California (which no longer exists) to honor John and Annie Bidwell and all the pioneers of California. 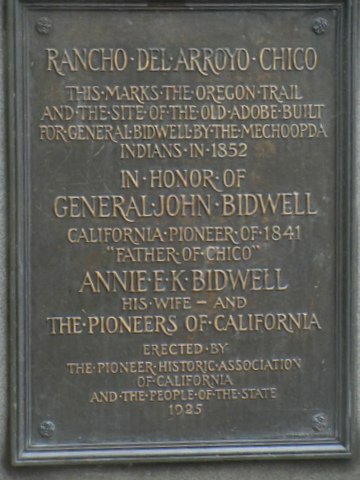 It marks the spot where Bidwell’s adobe stood by the side of the road that led to the northern mines and Oregon. What do you guess might be inside the box? A dry and dusty scroll commemorating the occasion? Pictures by school children? Mementos of John and Annie? A nice big gold nugget? The way to find out is to come to the grand opening on Saturday, November 29th at 10 a.m. at Bidwell Mansion State Historic Park. Come and find out what was placed in the time capsule 89 years ago. It’a an historic occasion!